CLICK HERE to order your copy of the Kindy Kitchen cookbook. How do you get kids to love their fruit and veg? Spark their imaginations! In KINDY KITCHEN you'll meet - and eat! - a Rainbow Fruit Serpent, a Pineapple Crocodile and a Cucumber Frog, and you'll discover a new flavour of fun with this amazingly entertaining and seriously adorable cookbook! With its delicious combination of illustrated rhymes and 30 juicy fresh fruit and vegetable recipes, KINDY KITCHEN will keep those rumbling little bellies full of what nature intended! 10 wonderful, illustrated adventure stories about the strange fruit and vegetable creatures that live inside a child’s kitchen. 10 innovative Kindy Kitchen™ recipes featuring the food character from the story with step-by-step instructions for your child to re-create it and then eat it! 20 additional Kindy Kitchen recipes featuring new and exciting food characters to ignite your child's imagination and fire up their appetites! Vital facts about the main ingredients and how they benefit health. Beautiful illustrations by award-winning illustrator Nettie Lodge. Captivating photographs by award-winning photographer Andreas Smetana. For a flavour of Kindy Kitchen please enjoy the short video below, which was made before the original series was turned into a cookbook by ABC Books. OUR NEW COOKBOOK GOT A MENTION IN THE DAILY MAIL! THE KINDY KITCHEN BOOKS WERE FEATURED IN THE SYDNEY MORNING HERALD ON JUNE 28TH 2014! KINDY KITCHEN HAS TEAMED UP WITH THE HEALTHY KIDS ASSOCIATION FOR FRUIT AND VEG MONTH 2014! IF YOU REGISTER YOUR SCHOOL TODAY YOU WILL RECEIVE 2 BOOKS FROM THE KINDY KITCHEN SERIES TO READ TO YOUR CLASS. You can read more about this exciting news here. 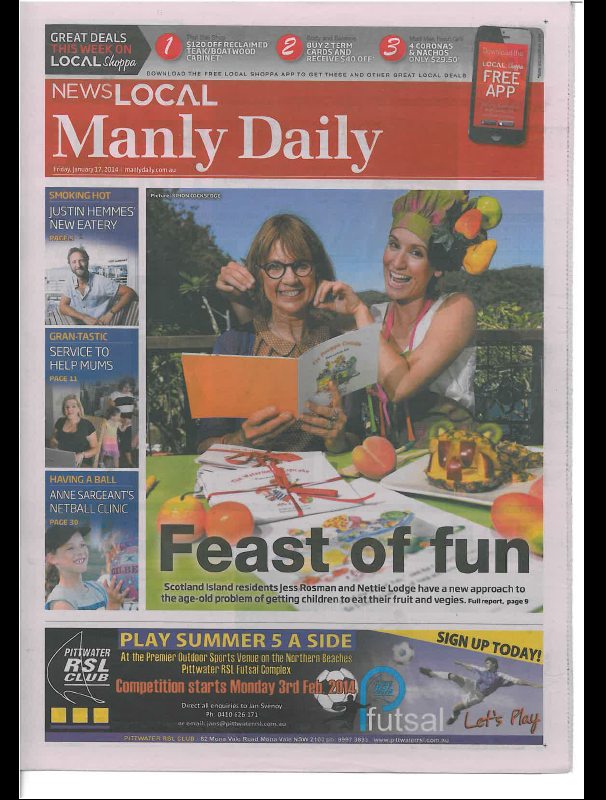 KINDY KITCHEN IS FRONT PAGE ON THE MANLY DAILY! Please visit our web-links page for the full article!